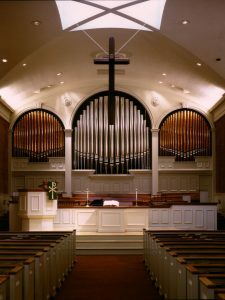 I envisioned the organ for Glenview Community Church to be something extremely grand and heroic. 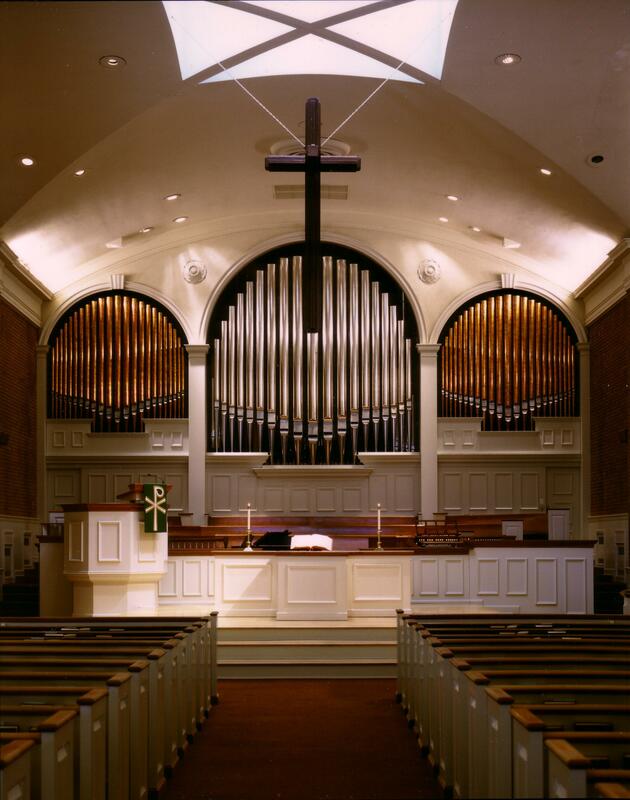 The sanctuary is designed in stately colonial style, and the sound of the organ had to be appropriate to the mass of the room. 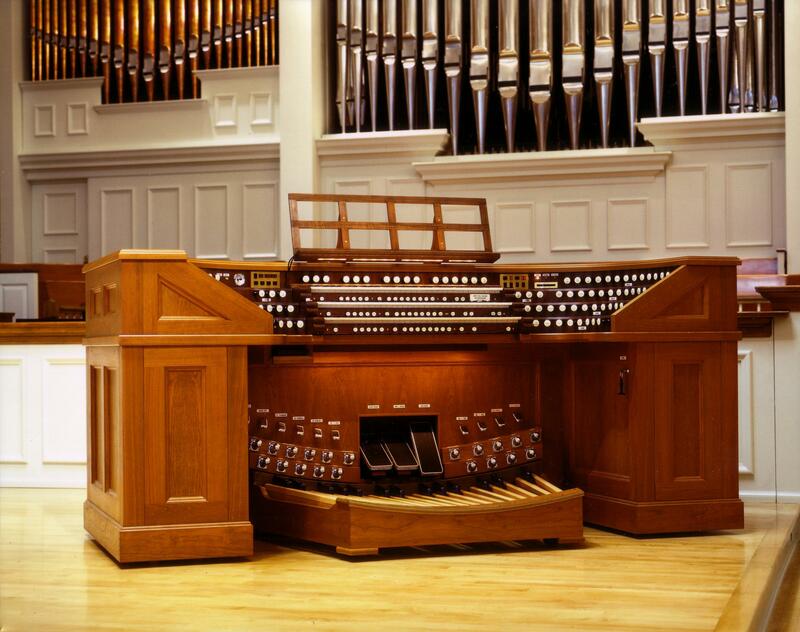 In order to serve the church’s far-reaching, eclectic music program, the instrument had to accompany choirs, lead congregational singing, musically render as much organ literature as possible, and be able to hold its own against a full symphony orchestra. 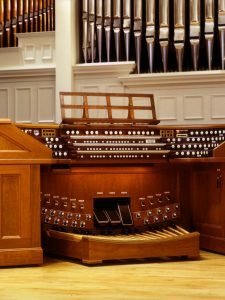 The organ had to be able to shake the floor while playing softly, but when playing loudly had to be perceived as noble and stately, without seeming too loud or overbearing. The organ had to able to play the cornerstones of the French, German and English repertoire, which meant embracing an eclectic style. However, the eclecticism had to have its own personality and be consonant with our developing tonal style. To this end, all of the stops and scalings spring from and relate to the Great First Open Diapason (8′). This hierarchical scaling practice, originally developed in Baroque-era Germany, is a beautiful classic framework upon which stops can be hung even if they are voiced in a more romantic cast. 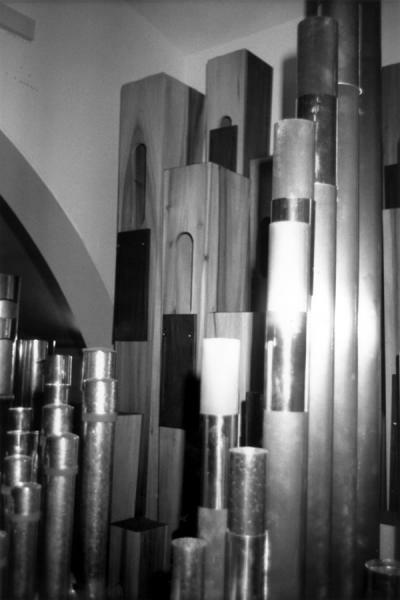 The organ has a full set of inter- and intra-divisional couplers at 16′ 8′ and 4′ and French Manual Transfer. The eclecticism runs not only from division to division, but also within each division. In our style, there is no “German Great, French Swell, English Choir, and “Pedal without a Country,” but within each division, every national style and period is honored. For example, the Great Principal Chorus, although scaled in a German discipline, speaks with an English accent. The Great Fonds d’orgue allow the Principals to make the short trip across the English channel to honor the French compositional school. The Swell, which must be able to contribute the fire and éclat for French music, must also enunciate grandeur and pomp in the “English Cathedral Swell tradition.” The reeds are of French construction (double blocks, open shallots), but are voiced with a moderate brightness. The choir division uses Principals built on English romantic constructional models, and is complete up through a 1′ Fourniture. 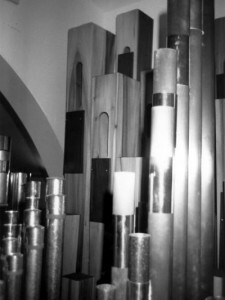 Reeds in the choir include a chorus trumpet and coloristic voices—Corno di bassetto and English Horn. A hallmark of our tonal style is the inclusion of a high-pressure solo reed, nearly always of Tuba class. The Tuba in this instrument, of extremely large scale and voiced on 15″ of wind, is particularly heraldic. One important feature of our tonal designs is that the pedal must always be able to balance the manuals, and provide a most solid foundation for the entire “Temple of Tone”. To this end, included are three 32′ flutes, a wooden 32′ Contra-Trombone on moderately high pressure, First andSecond 16′ Open Diapasons (one of wood, the other of metal) and the sumptious luxury of two independent 16′ reeds – a Trombone and a Bombarde. The pedal must have as much color as the manuals, therefore included are a wide variety of 8′ and 4′ flues and reeds. A distinguishing feature of the pedal upperwork is the 4′ open flute. It is made of wood and of large scale, similar to what our forebears would have called a Philomela. It is voiced on moderate wind pressure however, to sing out from its optimal vantage point right behind the façade to fulfill its solo role. The console is of French, curved terrace design, beautifully rendered in cherry and walnut. The Swell and Pedal stopknobs are on the left, Great and Choir on the right, the couplers in the center as in most American organs. Particular to this layout is that the low-pitched stops begin at the outside and move to the inside towards the keyboards as the pitches ascend. The result is a logical and elegant arrangement.